AN END OF AN ERA? | ItuaLive! The game of lawn tennis is not necessarily popular amongst us. The frenzy exhibited by fans for other sports such as soccer and to a lesser extent athletics is not accorded to tennis. But whether we are active followers or not, the name Roger Federer would ring a bell in every ear. Roger has lit up the world of lawn tennis in Nigeria and created a fan base that has grown gradually over the years. He, alongside the Williams sisters and Raphael Nadal have ensured that even lukewarm tennis fans have become keenly interested in how the Grand Slams go down. With 16 grand slam titles, a seemingly indomitable streak at the number one spot and a charming personality- both on and off the court- it is no wonder his support base is phenomenal. Federer has shown a type of consistency for high performance that is rarely seen particularly in contemporary sports. In eight years, he racked up 16 grand slam titles among other trophies. He also maintained his number one ranking for about five straight years and has managed to remain in the top three when not playing at his regular best. 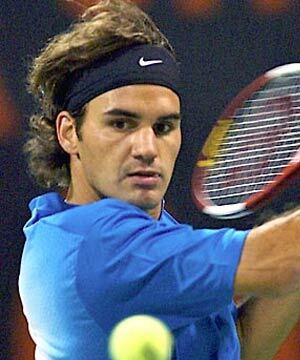 It has not always been rosy for Roger Federer; in fact at one point in his career (2003), Federer was labeled as the best player in tennis not to have won a Grand Slam title. That was soon to change as he started his historic grand slam haul that year and by 2009, he had won on all surfaces including Roland Garos. Federer’s all round game is superb and perhaps his greatest weapon is the mastery with which he wields his racket with pin-point accuracy when hitting the ball. The flair displayed when he switches from back hand to front is second to none. Off the court, he is also a gentle man, married to his long time girl friend and blessed with twins. He is among the rare list of sport mega stars not to be smeared with some form of “controversy” in their private lives. Most people are adulated after retirement but while still playing, Federer is already being labeled a legend. He is mentioned in the same breath with great names like Rod Laver, Pete Sampras and Bjorn Bjorg. I cannot completely discuss Federer’s career without mentioning Raphael Nadal. Rafael Nadal and Federer provided one of the greatest rivalries ever seen in the history of tennis rivaling that of McEnroe and Bjorg. At the time when Federer reigned supreme in men’s tennis, seeing him on the opposite side of the court was psychologically demoralizing for any opponent. He completely demolished those who stood in his way with ease until Nadal’s entrance onto the scene proved a stumbling block. Rafael Nadal’s physical approach to games coupled with his never-say-die attitude quickly proved to become Federer’s nemesis. Nadal’s advantage on clay began to extend to other surfaces until he wrested the top spot away from Federer. He is presently the only player to have a significant head-to-head advantage over Roger Federer. But unlike Nadal who left tennis fans feeling pity for his (Nadal’s) opponents, Federer’s sheer poetry on the court ensured that while he ravaged his opponents, fans gasped more at his artistry. Since 2008, Federer has shown a decline in consistency and achievements that has seen him drop in the world rankings to number three. His vulnerabilities were exposed by Tsonga at Wimbledon and also at the Rogers Cup. Some believe we have seen the end of the Federer especially with the likes Djokovic charting a new course. Federer’s supporters can point at his showing in Roland Garros and the fact that he is the only man so far to have beaten a fit Djokovic this year. I believe Federer still has a lot more to offer for as long as he remains in competitive tennis. If his comments in Flushing Meadows are anything to go by then we can expect him to throw everything he’s got to reclaim the number one spot. Since 2003, Federer has won at least one grand slam every year. He has only Flushing Meadows this year to maintain that tradition, and on his current form, it may be wishful thinking to assume he would accomplish this. One thing is for sure, should he retire now, Federer will be regarded as one of the greatest if not the greatest tennis player that ever graced this planet. I do agree that the Federer dynasty may have ended but I believe he still has one or two Grand Slams left in him. For Flushing Meadows, Djokovic starts as overwhelming favorite; he appears and has said he is completely over his Cincinati setback. The opening rounds support this. Nadal who is expected to provide Djokovic’s sternest challenge did not have the best of preparations and his once famous mental strength is already being questioned going by his recent comments. Federer has shown recently that players from the top ten can trouble him, while Murray has consistently taught us not to depend on him when it matters most. For the women, with the comeback queen and defending champion (Clijsters) not playing; with Sharapova out and the world number one not consistent enough, barring some snares from the old Soviet republics, I think Serena Williams can go all the way.